According to critics, government measures to ease Britain towards a greener future are likely to result in higher domestic energy bills. 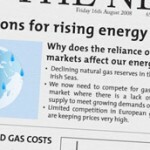 Volker Beckers, the chief executive of Npower, argued that the Coalition’s draft energy bill would inevitably lead to uncertainty in the market. Discussing some of the finer points of the bill, Mr Beckers said: “It’s too early to say the impact will be X percent on bills… we believe the introduction of a capacity mechanism will make the British energy sector highly inefficient, costing consumers many billions in unnecessary cost”. Consumer Focus, meanwhile, stressed that government ministers had no choice but to invest in renewable technology and that shifting some of the cost on to energy users was a necessary evil. Director of Energy at the group, Audrey Gallacher, added: “The Government must guarantee that any subsidies for new power generation and any rate of return to suppliers are fair and not overly generous at consumers’ expense”. Environmental campaigners have warned that the draft energy bill will do little to lift Britain’s dependence on gas central heating. Although some fossil fuels will be put on the back burner by the bill, wind, tidal and solar technologies would require far greater investment to replace gas and coal. An even greater problem looms after RWE and E.ON abandoned plans to build new nuclear power stations in the UK. Only EDF remains in contention to increase Britain’s nuclear energy capacity, making it highly likely that government ministers will need to look at other technologies to move away from fossil fuels. Carbon capture systems have been identified as a means by which coal-fired power plants could meet carbon emission targets, but the technology itself is said to be unproven. Commenting on the doomed nuclear ambitions of government, John Sauven, Greenpeace UK’s executive director, said: “It’s obvious that plans for new nuclear power stations have crumbled. The Government now has to drop its misguided affair with this hugely expensive pipe dream”. Mr Sauven added that Britain ought to invest more heavily in “home-grown renewable energy” such as solar PV, whilst striving to improve the efficiency of an energy infrastructure that has forced millions of people into fuel poverty.